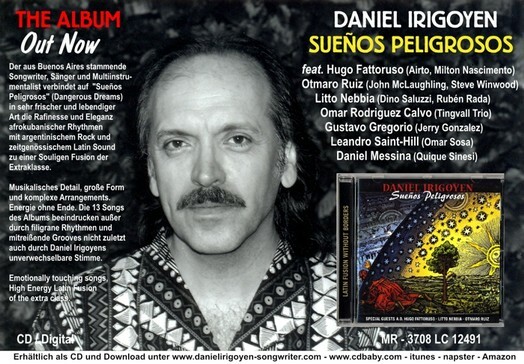 The music and poetry of Daniel Irigoyen are a leap into the sky, although in the attempt his wings burn like those of Icarus. Like in the Gilgamesch, he first goes down to the world of the dead, after which he appears like a medieval condemned in the Dante´s purgatorio, finding at last in the sky his Beatrice. 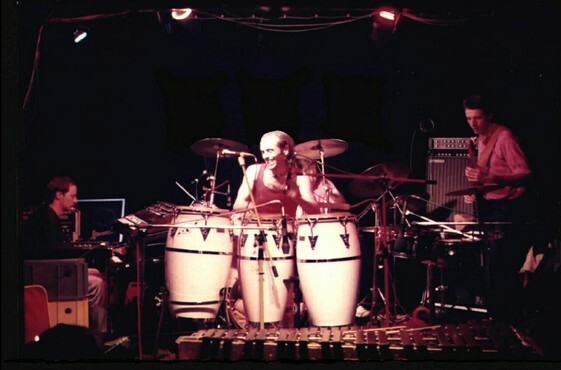 His message speak to us about the "Nomadism of the 21th century", and the substance of his music journeys impregnated with the 64 hexagrams of the I-Ching, with the 22 arcans of the Tarot and with the bio-cosmic mass of "Amerindia", plus the "Aché" that the Bata drums carry, that "Chango" likes so much. Shiva protects him, whiledancing the dance of life in the center of the universe, that is in each one of our hearts.With his voise, that has the chromatic variations of the deep cello of a chamber quartet, he was chosen to have the previlege, for this time, to represent with his songs the human race. 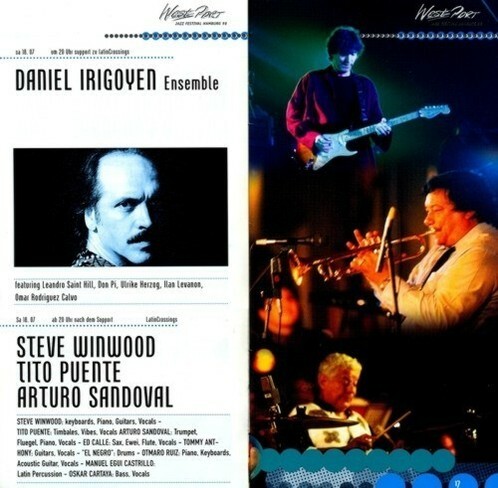 Daniel Irigoyen was born in Buenos Aires where he started his musical carer as drummer, percussionist, and singer/songwriter at the end of the sixties. 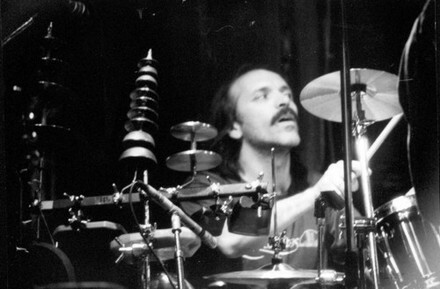 At that time he was one of the pioneers of "Rock Nacional", the first rock music movement worldwide using Spanish lyrics. He finally flew the military dictatorship of his country; travelling the world before settling down in Hamburg. The most important and impulse-setting element in his way of singing is rhythm. 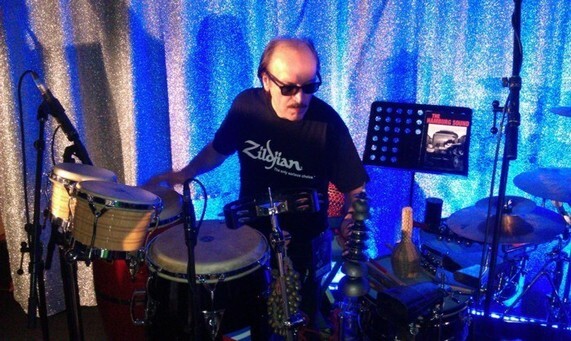 His musical repertoire extends from "Argentinian Rock", Funk, Jazz to Ethno and Latin-Fusion. Gwen McCrae, Mitch Rider, Hugo Fattoruso, Don Pi, Sandro, Litto Nebbia, Thomas Anders, Otmaro Ruiz, Matias Gonzalez, Joe Bataan, Quique Sinesi, Cesar Franov, Norberto "Pappo" Napolitano, Juan Rodriguez, Quique Alvarado, Rubén Biscione, Tito Larregui, Leandro Saint Hill, Omar Rodriguez Calvo, Charly Kingson, Goetz Steeger, André Rebstock, Volker Griepenstroh, Michael Heyer, Daniel Moreno, Dom Um Romao, Jorjao Barretto, Teo Lima, Sizao Machado, Alex Acuña, Freddie Santiago, Ismael Ivo, Marianne Rosenberg, Ken Taylor, Sebastian Rätter, Wolf Biermann, Ann Sexton, Gloria Scott, The Trammps, Daniel Volpini, Guillermo Marigliano, The Supremes, Leon Ware, Roachford, Max Mutzke, Omar, Steve Winwood (Support-LatinCrossings) ..
> Daniel is currently working on the elaboration of new material of songs which will be part of his next album.